A few days ago, when discussing the Mera Rubell talk at the Katzen, and her selection of 16 DC area artists being dubbed by the Washington Post as the "Sweet 16", I suggested that it would be a good idea for a DC glossy, like DC Modern Luxury for example, to hire a sharp photographer to assemble us 16 and re-do a modern version of the pose in Life Magazine's famous "Irascibles" photograph. The solemn people above, along with three others, made up the group of “irascible” artists who raised the biggest fuss about the Metropolitan’s competition (following pages). All representatives of advanced art, they paint in styles which vary from the dribblings of Pollock (LIFE, Aug. 8, 1949) to the Cyclopean phantoms of Baziotes, and all have distrusted the museum since its director likened them to “flat-chested” pelicans “strutting upon the intellectual wastelands.” From left, rear, they are: Willem de Kooning, Adolph Gottlieb, Ad Reinhardt, Hedda Sterne; (next row) Richard Pousette-Dart, William Baziotes, Jimmy Ernst (with bow tie), Jackson Pollock (in striped jacket), James Brooks, Clyfford Still (leaning on knee), Robert Motherwell, Bradley Walker Tomlin; (in foreground) Theodoros Stamos (on bench), Barnett Newman (on stool), Mark Rothko (with glasses). 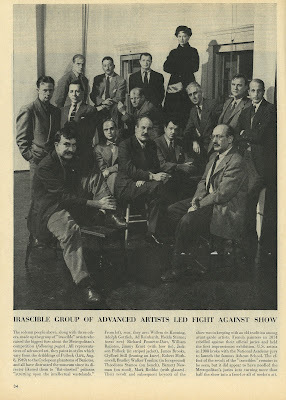 Their revolt and subsequent boycott of the show was in keeping with an old tradition among avant-garde artists. French painters in 1874 rebelled against their official juries and held the first impressionist exhibition. U.S. artists in 1908 broke with the National Academy jury to launch the famous Ashcan School. The effect of the revolt of the “irascible” remains to be seen, but it did appear to have needled the Metropolitan’s juries into turning more than half the show into a free-for-all of modern art. Someone once told me that originally there were only men in the group, and the photographer (I think) insisted on having a woman as well, and Hedda Sterne, who throughout her career maintained a stubborn independence from styles and trends, was brought in for the photo shoot, even though she wasn't one of the signers of the letter to the Met. Thus my brilliant marketing idea of the "Sweet 16" recreating the above photo for a DC magazine. I got dibs on Richard Pousette-Dart's cool pose on the second row from the back. "I see hints, at least, that we're a country that just spent something like a trillion dollars and more than 3,000 lives so that a foreign nation's sects can once again be free to bash each other. And I see a country that is still hemorrhaging blood and funds in the fond hope that another foreign nation, dysfunctional and misogynist, can be kept from fully imploding. Here at home, I see the richest nation in history being so obsessed with getting back to still more growth -- so that the rich among us can have a yet bigger house or plasma screen -- that it won't spend money to rescue a neighbor's health, a crumbling bridge or our children's planet. Most important -- if not in the details of this biennial, then in the overriding spirit of so much of its art -- I also see a country that recognizes that all this is some kind of a problem but feels as though it's powerless to do anything about it -- except take solace in that bigger home or screen." Not all of it sounds like a Keith Olberman rant; read the rest of the review by the Washington Post's Chief Art Critic here. I've been hearing some good things about the Kevin Mellema solo show, consisting of eight of his large scale figure drawings, at the Lee Arts Center on Lee Highway in Arlington. 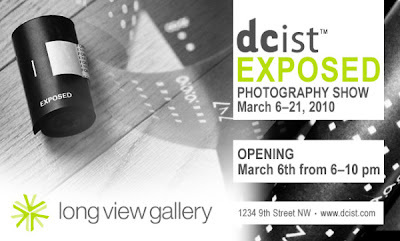 They will have a closing reception from 6:30 to 8:30 pm on Wednesday, March 24, 2010. I will try to check it out.